Lincoln Electric showcased its latest welding-fume-extraction technology for large- and small-scale fabrication, including full, banked extraction and filtration systems as well as compact mobile offerings. 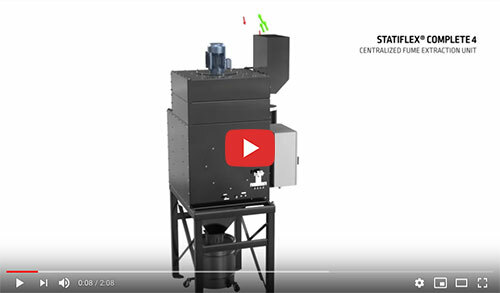 The Statiflex Complete series of weld-fume-control systems, available in 4-, 8- or 12-bank configurations, functions in a range of applications including automation, robotic booths, fabrication, indoor welding facilities and welding education/training. All systems come with the Lincoln Smart Connect control panel for filter cleaning, and offer optional Spark Guardian spark arrestors for applications with increased fire risks and optional Transformer Kits for 575-V applications. All systems also have MERV 11 and 16 filter-cartridge options. The Statiflex Complete 4 system includes a 4-hp fan motor with variable-speed starter, while the Statiflex Complete 8 and 12 systems each include a 10-hp motor with variable-speed starter. Reported benefits include quiet operation, automatic cleaning, intelligent fan-control technology, small footprint, and quick and simple installation. This series functions with a multitude of welding processes. The new Mobiflex 400-MS mobile welding-fume extractor with automatic filter cleaning, designed to extend filter life and reduce maintenance, is ideal for smaller facilities, according to company officials, and provides light- to medium-duty fume extraction in variable locations. Its RotaPulse automatic-filter-cleaning system and large filter capacity enable users to decrease downtime via fewer filter changes. The filter-status indicator monitors the amount of particulate in the filter cartridge to alert users when replacement is needed. And, the internal spark arrestor, functioning as a pre-filter for larger-sized particulate, prevents sparks from reaching the filter. The Mobiflex 400-MS base unit includes a plastic housing, 2-ft. flexible hose, and choice of MERV 14- or MERV 16-rated filters. A 10- or 13-ft. extraction arm, with or without the factory-installed arc sensor/lamp kit, or a hose/hood set is required to complete the system.